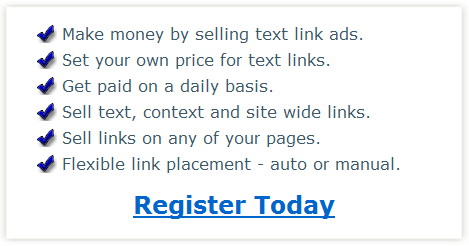 Make money selling text link ads on your websites. Our publisher program allows site owners to sell links on any page of their websites. Our convenient system has a very flexible link placement mechanism, where publisher can decide whether they want to install an automated script for text links to be placed automatically or whether they want to control this process and place all sold backlinks manually. Publishers have full control on the price they want to get when they sell text links from their website. All profits are calculated on a daily basis, which means that you make money every day, no matter how long a particular link was placed on your web site. For example if you sell backlinks on one of your websites and they were removed several days later, you will get money for all days text link ads were live on your site. We have a big number of advertisers, which is growing every day. When you add your pages into our marketplace, they become available to our advertisers immediately. This means that you can start making money straight away. Sell text links ads to any of our advertisers and start making money today! When you sell links via our brokerage system, you have a full benefit of our convenient dashboard, which shows your income on a daily and on a monthly basis. We have a lot of other benefits for those who want to sell text link ads via our publisher program, so we encourage you to join our program today absolutely free, so you can sell text links and make more money from your web pages.